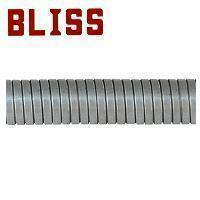 SUS 304 Stainless Steel Flexible Metal Conduit (Interlocked)(A7013) - Bliss Yih Enterprise Co., Ltd.
★Flexible metal conduit (inter-locked) is used for the protection of electric wire/cable and other related products. It also can solve the problem of construction of angle that the rigid pipes (such as steel pipes and PVC pipe) can not overcome and then becomes easily in the installation and operation of wires/pipes, as well as liquid-tight, flame retardant, vibration-proof, anti-interference, etc. ★Flexible metal conduit (interlocked) applicable to indoor working place where temperature is high, please refer to "Appendix 1: Flexible Conduit and Connector Application Illustration”. #304 Stainless steel core, not liquid-tight. Flat and smooth internal surface for better cable installation. For large machinery or automatic machine which requires heavey bearing and tensile property. For transportation facility and heavy industry. SUS316 Stainless steel core available, type A7016. For high corosion area, e.g. seashore.